Why Are Wasps Important to Our Environment? 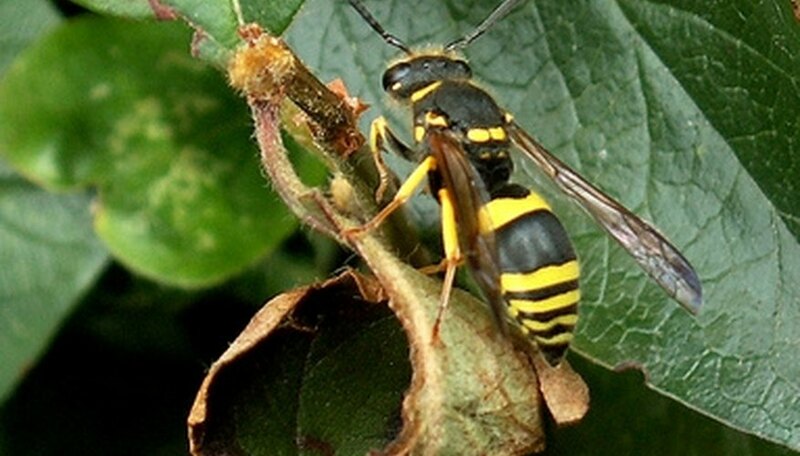 Wasps are winged insects, distinguishable from yellow jackets by their slender bodies and long legs. They have many environmental benefits, despite their tendencies to sting humans. If they are not in a location where they are exposed to people, they should be left alone. Wasps give their young smaller insects, such as aphids, for food. These insects often destroy gardens by eating your plants. Wasps also eat houseflies and blowfly larva, decreasing the appearance of these pests as well. Some wasps pollinate flowers. They are not as effective pollinators as bees, because they do not have hairs like bees, but they do contribute to the pollination of flowers and other plants. 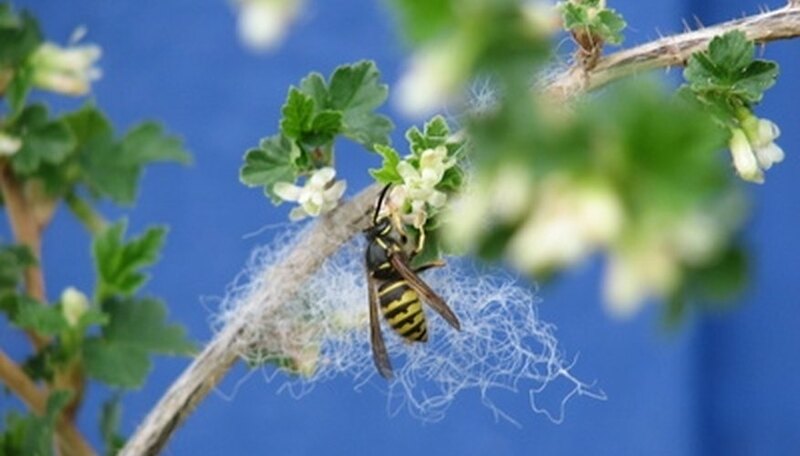 If a nest is in a place where wasps are becoming a danger to yourself or others, spray the nest with an aerosol for killing wasps, widely available in drugstores or hardware stores. Spray in early morning or late evening, and wait a few days before removing the nest. Spray your papaya plants with the insecticide Permethrin. Apply the Pounce 3.2 variety at 8 oz. per acre of tree, or Ambush at 12.8 oz. per acre of tree in 100 gallons of water. Apply this no more than two times a season, and no later than seven days before the harvest. Tie a 3- to 5-pound paper bag to the stems of each, individual papaya fruit to prevent new wasps from laying eggs inside the fruit. Wrap the fruit while they are small and the flowers have just fallen off. Check the bags every 10 to 14 days to ensure they are still intact. Remove any dead or decaying fruit from the branches and from below the tree to prevent wasps from laying eggs in the decaying fruit. Wasps are often portrayed as one of the villains of the animal kingdom, but wasps kill a number of insects that are regarded as pests, acting as a natural pesticide. Parasitic wasps can benefit farmers and farm animals by controlling flies. Wasps are often overlooked as being important pollinators. Pollinating wasps include the tiny fig wasp of Western Asia, which pollinates about a thousand different species of fig tree, and the scoliid wasp of Australia, which pollinates several types of orchid. Wasps eat rotting fruit such as apples and act as one of nature's cleaners. Wasps are not always aggressive, but they are territorial. And they sometimes are aggressive after eating fermented fruit, which has an inebriating effect on them. Locate the nest. Wasps often build nests beneath the overhangs of buildings, in tree logs or underground within a 250-meter radius of anywhere an individual is spotted. Follow adult wasps at nightfall to find their nests. After the sun has gone down, generously dust the wasp nest with PyGanic Dust or Pyrenone insecticide. If wasps start to emerge, you may also dust them with the insecticide to prevent being stung. Seal the entrance hole with plaster of Paris or oil. This prevents wasps from digging out of their nest or forming a new one from the old structure. Monitor the nests for the next several days and reapply insecticide if any stragglers remain. Once nest is fully abandoned, you may remove it by calling professional exterminators or digging it up in fully protective clothing.